Windows Update occasionally gets a bee in its bonnet and refuses to work. Should that surprise anyone? Unfortunately, unlike some other Windows problems, this one seldom goes away on its own. And the exact cause isn't always easy to diagnose and fix. I'll start with some solutions to a very common, XP-specific Windows Update problem. Then I'll tell you where to go for additional advice. If you're running Windows XP, and Windows Update tells you that one or more updates failed to install successfully, try my handy-dandy repair batch file. Actually, I've written two batch files--one for the 32-bit version of XP, and another for the 64-bit version. Simply download and run the appropriate one. Unfortunately, when you try to download a batch file in Firefox, it merely displays the contents of the file (in plain, ASCII text) instead of downloading the file. The easiest workaround, other than using Internet Explorer, is to copy the text to Notepad and save it as a batch (.bat) file rather than as a default text (.txt) file. When you run the batch file and it displays a message box, click OK.
1. Click Start, Run, Browse. 2. Locate and double-click the file you just downloaded. Doing so will insert the path and the file name into the run box. 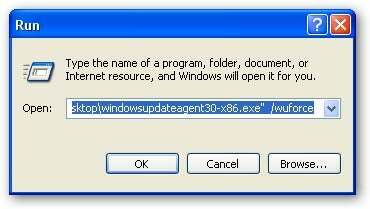 In the Run box, enter the text /wuforce after the Windows Update Agent file name. space before the slash) after the file name. Press ENTER and follow the wizard. If you aren't using XP, or if neither of the preceding fixes work, you might try downloading the problematic update manually and then installing it from your hard drive. That approach probably won't work, but it's worth a try. In Internet Explorer (not Firefox), go to the Microsoft Update Catalog to find and download the problem updates. Finally, at the Windows Update Troubleshooter you stand a good chance of finding the cause of and solution to your particular problem. Once again, this Web page doesn't like any browser except Internet Explorer. There's also a separate Vista Troubleshooter. And amazingly, this one works just fine in Firefox. E-mail your technology questions to answer@pcworld.com, or post them to a community of helpful folks on the PCW Answer Line forum.